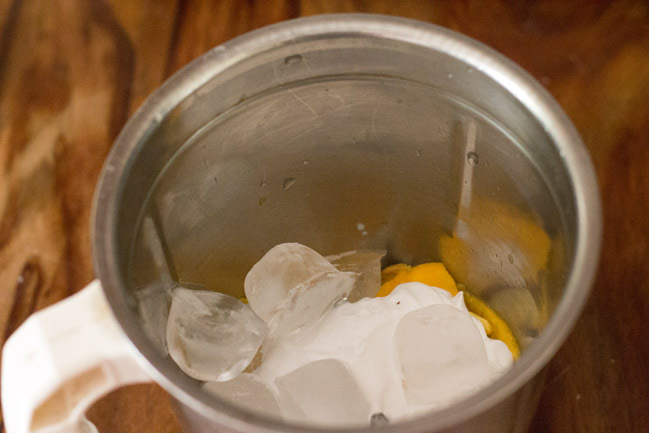 Mango Milkshake recipe with step by step photos. 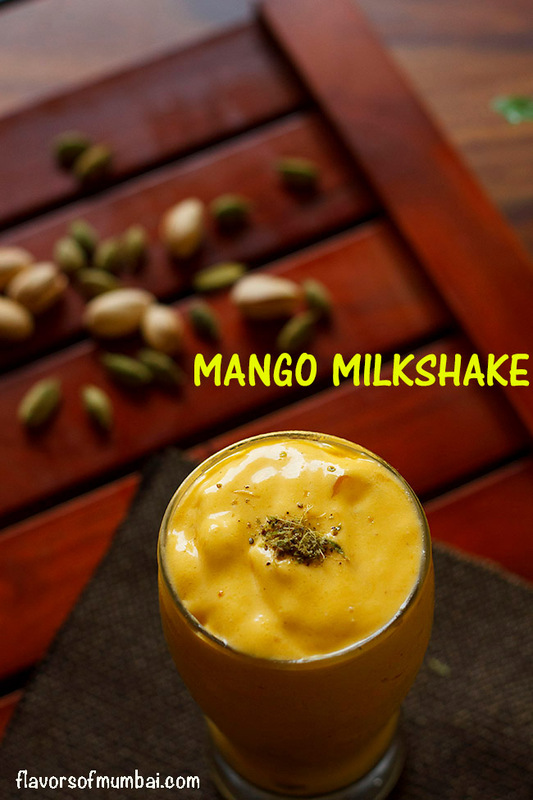 This is a easy peasy mango milkshake made merely with 3 ingredients is vegan, yet healthy and delicious. Its summer time in India and season of mangoes, so the best time to make something from the king of fruits. I have posted earlier mango milkshake but that one is made from cows milk, this is made from coconut milk. You can alternatively use soy milk or almond milk or even cashew milk whatever you prefer. You can use home made thick coconut milk made from the first press or can use store bought coconut milk. 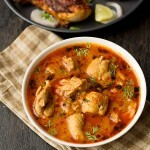 I have used dabur home-made coconut milk for this recipe. Love all fruits but mangoes hold special place in my heart especially the alphonso and fleshy pulp mangoes. Which is your favorite fruit? To spice up the shake I have spiced with cardamom powder. Love cardamom flavor and the aroma too. 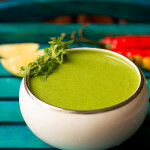 But you can use vanilla essence or nutmeg powder or can skip, if you are not fond of any spice or aroma in your drink. I am in too much love with cardamom and regularly sip cardamom tea, happens to be one of my favorite chai. 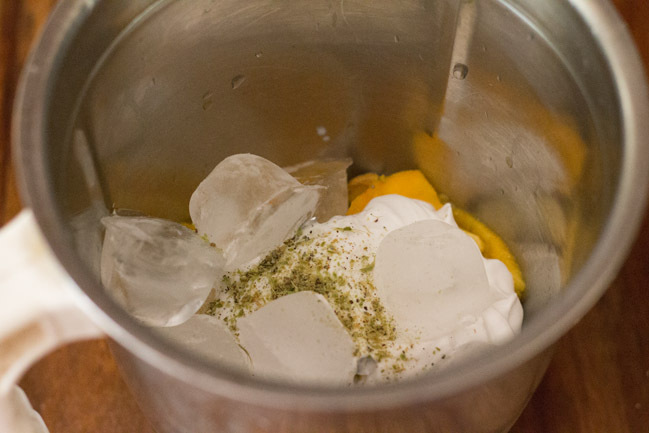 Make your drink healthier by adding nuts like pistachios or you can use saffron too. Adding sugar is optional generally Alphonso mangoes are sweet enough but if your mango or mango pulp is not sweet then you can add a dash of sugar or jaggery powder to sweeten it and jaggery is a healthier option. Wash 1 mango, wipe and chop them. Add them to the blender. 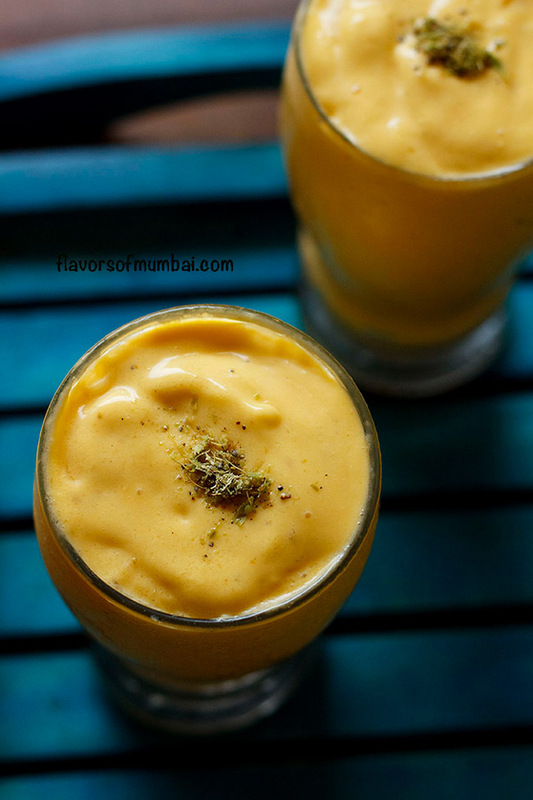 If using mango puree then add 1 cup mango puree.Add 1 cup of coconut milk along 5 to 6 ice cubes. Lastly add 1 teaspoon cardamom powder or 1 teaspoon vanilla essence (its optional). Alternatively you can use a pinch of nutmeg powder instead of vanilla essence and cardamom. 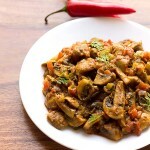 I prefer cardamom powder, you can skip adding any spiced powder or essence too. 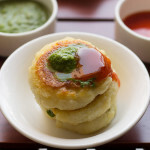 Adding sugar or jaggery powder is optional. Blend till smooth and creamy, Pour into the glasses and serve chilled. If serving later then refrigerate. 1. You can use cows milk for this recipe. 2. 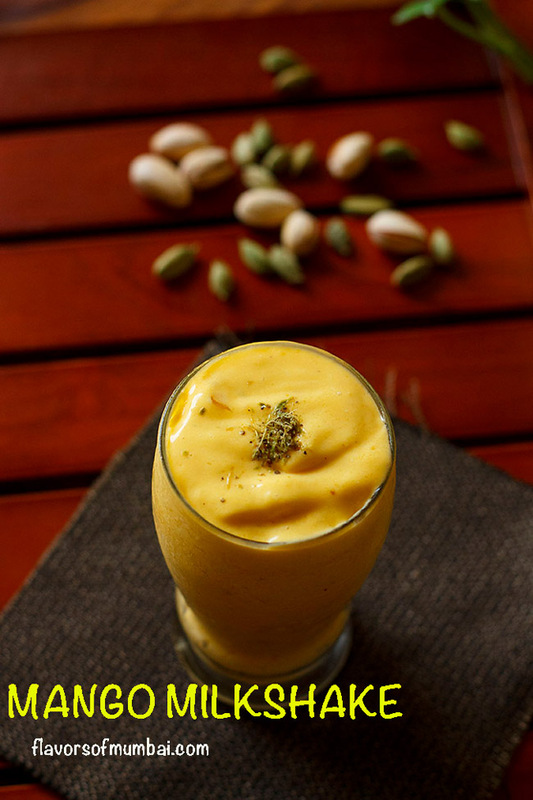 Make this shake more healthier by adding nuts like pistachios, almonds or you can even add saffron to it. 3. You can double the recipe by doubling up the quantity of the ingredients. 1. Wash 1 mango, wipe and chop them. Add them to the blender. 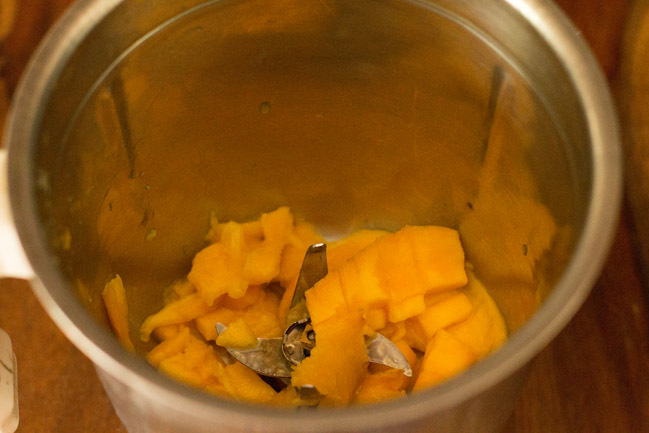 If using mango puree then add 1 cup mango puree. 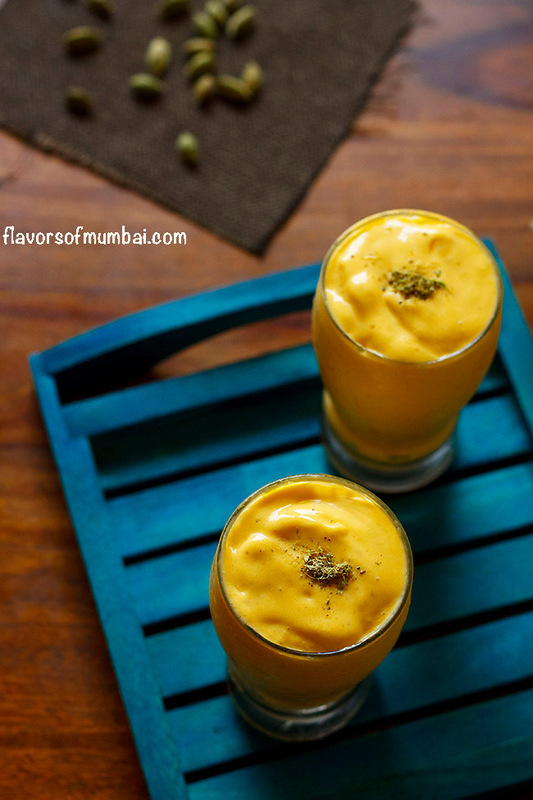 Always preferable to use pulpy mangoes for milkshakes so choose your mangoes wisely. 2. Add 1 cup of coconut milk along 5 to 6 ice cubes. If you are not vegan then use cows milk, you also use soy milk or almond milk. 3. Lastly add 1 teaspoon cardamom powder or 1 teaspoon vanilla essence (its optional). Alternatively you can use a pinch of nutmeg powder instead of vanilla essence and cardamom. 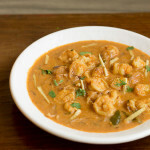 I prefer cardamom powder, you can skip adding any spiced powder or essence too. 4. 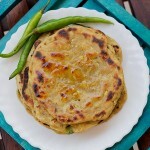 Adding sugar or jaggery powder is optional, if mangoes are not sweet then add them accordingly. The mango I used was sweet enough so didn’t require to use any sweetener. Blend till smooth and creamy, Pour into the glasses and serve chilled. If serving later then refrigerate.